Track, Polydor, Atlantic, Atco, Decca, Rykodisc, Warner Bros.
Peter Dennis Blandford "Pete" Townshend (born 19 May 1945) is an English rock musician, songwriter and author best known as the founder of the band The Who. Beginning in 1961, he studied graphic design at Ealing Art College. At Ealing, Townshend studied with future Rolling Stones guitarist Ronnie Wood and future Queen singer Freddie Mercury. 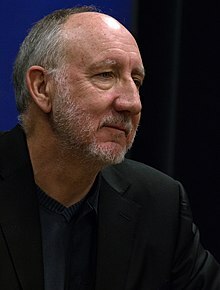 Townshend is the primary songwriter for The Who and has written over one hundred songs for the band's eleven studio albums including the rock operas "Tommy" and "Quadrophenia" and the popular rock radio staple "Who's Next." Although known mainly as a guitarist he is also an accomplished singer and keyboard player and has played many other instruments including: banjo, accordion, bass guitar and drums. Townshend has also written many newspaper and magazine articles, books, book reviews, essays and scripts. Townshend was ranked #3 in Dave Marsh's list of best guitarists in "The New Book of Rock Lists" and #50 in Rolling Stone Magazine's list of the "100 Greatest Guitarists of All Time." Townshend in 2007 at the Who concert at the Verizon Center in Washington, D.C. This page was last changed on 16 September 2015, at 07:39.